For other uses, see Ion (disambiguation). An ion (/ˈaɪɒn, -ən/) is an atom or molecule that has a net electrical charge. Since the charge of the electron (considered "negative" by convention) is equal and opposite to that of the proton (considered "positive" by convention), the net charge of an ion is non-zero due to its total number of electrons being unequal to its total number of protons. A cation is a positively charged ion, with fewer electrons than protons, while an anion is negatively charged, with more electrons than protons. Because of their opposite electric charges, cations and anions attract each other and readily form ionic compounds. Ions consisting of only a single atom are termed atomic or monatomic ions, while two or more atoms form molecular ions or polyatomic ions. In the case of physical ionization in a medium, such as a gas, "ion pairs" are created by ion collisions, where each generated pair consists of a free electron and a positive ion. 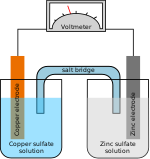 Ions are also created by chemical interactions, such as the dissolution of a salt in liquids, or by other means, such as passing a direct current through a conducting solution, dissolving an anode via ionization. The word ion comes from the Greek word ἰόν, ion, "going", the present participle of ἰέναι, ienai, "to go". This term was introduced (after a suggestion by William Whewell) by English physicist and chemist Michael Faraday in 1834 for the then-unknown species that goes from one electrode to the other through an aqueous medium. Faraday did not know the nature of these species, but he knew that since metals dissolved into and entered a solution at one electrode and new metal came forth from a solution at the other electrode; that some kind of substance has moved through the solution in a current. This conveys matter from one place to the other. In correspondence with Faraday, Whewell also coined the words anode and cathode, as well as anion and cation as ions that are attracted to the respective electrodes. Svante Arrhenius put forth, in his 1884 dissertation, his explanation of the fact that solid crystalline salts dissociate into paired charged particles when dissolved, for which he would win the 1903 Nobel Prize in Chemistry. Arrhenius' explanation was that in forming a solution, the salt dissociates into Faraday's ions. Arrhenius proposed that ions formed even in the absence of an electric current. As charged objects, ions are attracted to opposite electric charges (positive to negative, and vice versa) and repelled by like charges. When they move, their trajectories can be deflected by a magnetic field. Electrons, due to their smaller mass and thus larger space-filling properties as matter waves, determine the size of atoms and molecules that possess any electrons at all. Thus, anions (negatively charged ions) are larger than the parent molecule or atom, as the excess electron(s) repel each other and add to the physical size of the ion, because its size is determined by its electron cloud. Cations are smaller than the corresponding parent atom or molecule due to the smaller size of the electron cloud. One particular cation (that of hydrogen) contains no electrons, and thus consists of a single proton - very much smaller than the parent hydrogen atom. Hydrogen atom (center) contains a single proton and a single electron. Removal of the electron gives a cation (left), whereas addition of an electron gives an anion (right). The hydrogen anion, with its loosely held two-electron cloud, has a larger radius than the neutral atom, which in turn is much larger than the bare proton of the cation. Hydrogen forms the only charge-+1 cation that has no electrons, but even cations that (unlike hydrogen) still retain one or more electrons are still smaller than the neutral atoms or molecules from which they are derived. "Cation" and "Anion" redirect here. For the particle physics/quantum computing concept, see Anyon. For other uses, see Ion (disambiguation). Cations and anions are measured by their ionic radius and they differ in relative size: "Cations are small, most of them less than 10−10 m (10−8 cm) in radius. But most anions are large, as is the most common Earth anion, oxygen. From this fact it is apparent that most of the space of a crystal is occupied by the anion and that the cations fit into the spaces between them." Ions can be non-chemically prepared using various ion sources, usually involving high voltage or temperature. These are used in a multitude of devices such as mass spectrometers, optical emission spectrometers, particle accelerators, ion implanters, and ion engines. As reactive charged particles, they are also used in air purification by disrupting microbes, and in household items such as smoke detectors. As signalling and metabolism in organisms are controlled by a precise ionic gradient across membranes, the disruption of this gradient contributes to cell death. This is a common mechanism exploited by natural and artificial biocides, including the ion channels gramicidin and amphotericin (a fungicide). Inorganic dissolved ions are a component of total dissolved solids, a widely-known indicator of water quality. The ionizing effect of radiation on a gas is extensively used for the detection of radiation such as alpha, beta, gamma and X-rays. The original ionization event in these instruments results in the formation of an "ion pair"; a positive ion and a free electron, by ion impact by the radiation on the gas molecules. The ionization chamber is the simplest of these detectors, and collects all the charges created by direct ionization within the gas through the application of an electric field. The Geiger–Müller tube and the proportional counter both use a phenomenon known as a Townsend avalanche to multiply the effect of the original ionizing event by means of a cascade effect whereby the free electrons are given sufficient energy by the electric field to release further electrons by ion impact. When writing the chemical formula for an ion, its net charge is written in superscript immediately after the chemical structure for the molecule/atom. The net charge is written with the magnitude before the sign; that is, a doubly charged cation is indicated as 2+ instead of +2. However, the magnitude of the charge is omitted for singly charged molecules/atoms; for example, the sodium cation is indicated as Na+ and not Na1+. example seen above is occasionally referred to as Fe(II) or FeII. The Roman numeral designates the formal oxidation state of an element, whereas the superscripted numerals denote the net charge. The two notations are, therefore, exchangeable for monatomic ions, but the Roman numerals cannot be applied to polyatomic ions. However, it is possible to mix the notations for the individual metal centre with a polyatomic complex, as shown by the uranyl ion example. If an ion contains unpaired electrons, it is called a radical ion. Just like uncharged radicals, radical ions are very reactive. Polyatomic ions containing oxygen, such as carbonate and sulfate, are called oxyanions. Molecular ions that contain at least one carbon to hydrogen bond are called organic ions. If the charge in an organic ion is formally centred on a carbon, it is termed a carbocation (if positively charged) or carbanion (if negatively charged). Monatomic ions are formed by the gain or loss of electrons to the valence shell (the outer-most electron shell) in an atom. The inner shells of an atom are filled with electrons that are tightly bound to the positively charged atomic nucleus, and so do not participate in this kind of chemical interaction. The process of gaining or losing electrons from a neutral atom or molecule is called ionization. This driving force is what causes sodium and chlorine to undergo a chemical reaction, wherein the "extra" electron is transferred from sodium to chlorine, forming sodium cations and chloride anions. Being oppositely charged, these cations and anions form ionic bonds and combine to form sodium chloride, NaCl, more commonly known as table salt. 4. Ammonia and ammonium have the same number of electrons in essentially the same electronic configuration, but ammonium has an extra proton that gives it a net positive charge. 3. However, this ion is unstable, because it has an incomplete valence shell around the nitrogen atom, making it a very reactive radical ion. Ionic bonding is a kind of chemical bonding that arises from the mutual attraction of oppositely charged ions. Ions of like charge repel each other, and ions of opposite charge attract each other. Therefore, ions do not usually exist on their own, but will bind with ions of opposite charge to form a crystal lattice. The resulting compound is called an ionic compound, and is said to be held together by ionic bonding. In ionic compounds there arise characteristic distances between ion neighbours from which the spatial extension and the ionic radius of individual ions may be derived. The most common type of ionic bonding is seen in compounds of metals and nonmetals (except noble gases, which rarely form chemical compounds). Metals are characterized by having a small number of electrons in excess of a stable, closed-shell electronic configuration. As such, they have the tendency to lose these extra electrons in order to attain a stable configuration. This property is known as electropositivity. Non-metals, on the other hand, are characterized by having an electron configuration just a few electrons short of a stable configuration. As such, they have the tendency to gain more electrons in order to achieve a stable configuration. This tendency is known as electronegativity. When a highly electropositive metal is combined with a highly electronegative nonmetal, the extra electrons from the metal atoms are transferred to the electron-deficient nonmetal atoms. This reaction produces metal cations and nonmetal anions, which are attracted to each other to form a salt. ^ "Ion" entry in Collins English Dictionary. ^ a b Frank A. J. L. James (ed.). The Correspondence of Michael Faraday, Vol. 2: 1832-1840. p. 183. ISBN 9780863412493. ^ Michael Faraday (1791-1867). UK: BBC. ^ "Online etymology dictionary". Retrieved 2011-01-07. ^ "The Nobel Prize in Chemistry 1903". www.nobelprize.org. ^ Harris, William; Levey, Judith, eds. (1975). The New Columbia Encyclopedia (4th ed.). New York City: Columbia University. p. 155. ISBN 978-0-231-03572-9. ^ Goetz, Philip W. (1992). McHenry, Charles, ed. The New Encyclopædia Britannica. Chicago: Encyclopaedia Britannica Inc. 1 (15 ed.). Chicago: Encyclopædia Britannica, Inc. p. 587. Bibcode:1991neb..book.....G. ISBN 978-0-85229-553-3. ^ Cillispie, Charles, ed. (1970). Dictionary of Scientific Biography (1 ed.). New York City: Charles Scribner's Sons. pp. 296–302. ISBN 978-0-684-10112-5. ^ Oxford University Press (2013). "Oxford Reference: OVERVIEW anion". oxfordreference.com. ^ University of Colorado Boulder (November 21, 2013). "Atoms and Elements, Isotopes and Ions". colorado.edu. ^ Oxford University Press (2013). "Oxford Reference: OVERVIEW cation". oxfordreference.com. ^ Douglas W. Haywick, Ph.D.; University of South Alabama (2007–2008). "Elemental Chemistry" (PDF). usouthal.edu. ^ Purdue University (November 21, 2013). "Amino Acids". purdue.edu. ^ a b c "Common Ions and Their Charges" (PDF).